St., New York, NY 10010-1062. Peri- odicals Postage Paid at New York, NY and additional mailing offces. Dennis Bryant is with Bryant’s Maritime Consulting, and a regu- Professional and MarineNews magazines. He can be reached any advertising. 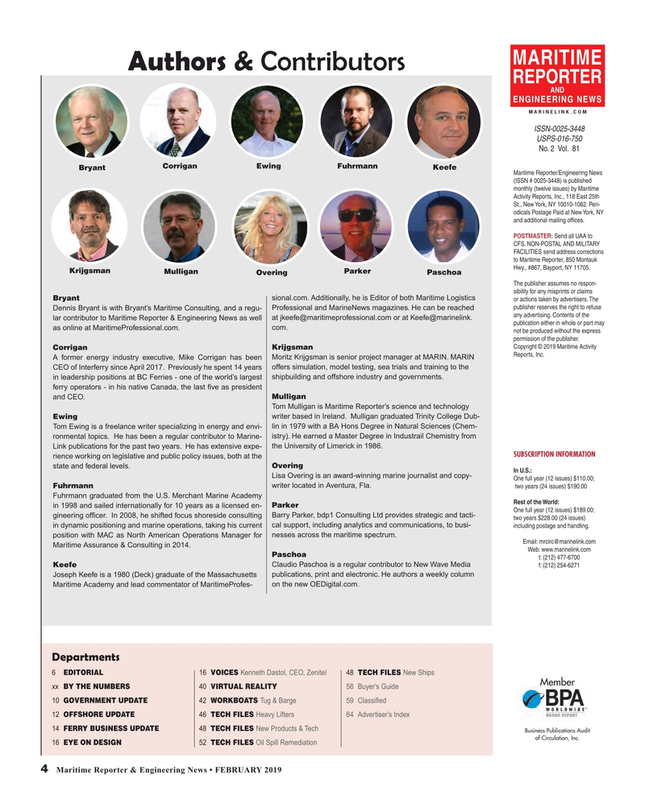 Contents of the lar contributor to Maritime Reporter & Engineering News as well at jkeefe@maritimeprofessional.com or at Keefe@marinelink. publication either in whole or part may as online at MaritimeProfessional.com. com. not be produced without the express permission of the publisher. CEO of Interferry since April 2017. Previously he spent 14 years offers simulation, model testing, sea trials and training to the in leadership positions at BC Ferries - one of the world’s largest shipbuilding and offshore industry and governments. Link publications for the past two years. He has extensive expe- the University of Limerick in 1986. One full year (12 issues) $189.00; gineering offcer. In 2008, he shifted focus shoreside consulting Barry Parker, bdp1 Consulting Ltd provides strategic and tacti- two years $228.00 (24 issues) in dynamic positioning and marine operations, taking his current cal support, including analytics and communications, to busi- including postage and handling. position with MAC as North American Operations Manager for nesses across the maritime spectrum. Maritime Assurance & Consulting in 2014. Maritime Academy and lead commentator of MaritimeProfes- on the new OEDigital.com.